← Join us at the Morgan Junction Community Festival! Updated: West Seattle Emergency Communication Hub maps! We’re excited to announce that West Seattle Be Prepared has another new emergency communication hub! The new 12th hub is located at the Highland Park Improvement Club, 1116 SW Holden Street. We’ve also made minor location adjustments to two of the long-established hubs. Pigeon Point (hub #5) has moved 2+ blocks further south on 20th Ave SW from SW Andover to SW Genesee Street to be closer to the school. Morgan Junction (hub #6) has moved from the Thriftway lot to Morgan Junction Park at 6413 California Ave SW (a half block north and across the street). Following is an updated map showing these changes. You can pick up printed copies of these maps at West Seattle SummerFest next weekend (July 11-13). We’ll be there doing outreach in the Community booth near the intersection of California and Alaska from 10 AM until 2 PM on Saturday, July 12th. Hope you’ll stop by! 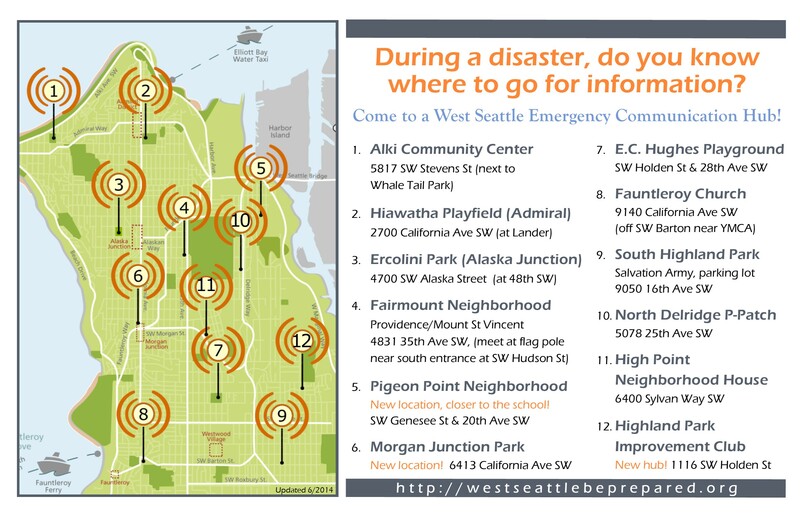 Added 7/6/14: We’ve created a printable flyer of the map above that has additional information about the West Seattle hubs: WS-emergency-communication-hubs-flyer (.pdf). This entry was posted in Announcements, Community Resources, West Seattle Be Prepared and tagged emergency communication hub map, West Seattle Be Prepared, West Seattle Emergency Communication Hubs, West Seattle emergency preparedness. Bookmark the permalink.